A sparkling display by Eden Hazard led Chelsea to a 2-1 Premier League win at Brighton & Hove Albion this afternoon. Chelsea controlled the first half and were 2-0 ahead at the break with goals from Pedro and Eden Hazard. Marcos Alonso rattled a post as the visitors went close to going three ahead just moments before Solly March made it 2-1 after 66 minutes. Despite late Albion pressure, the visitors held on for all three points. Albion made three changes from their 1-0 defeat at Burnley last week, with Martin Montoya, Dale Stephens and Glenn Murray coming in for Bruno, Yves Bissouma and Florin Andone. Chelsea named an unchanged line-up from their 2-0 victory over reigning champions Manchester City last week. David Luiz fired a 30-yard free kick straight at Brighton keeper Mathew Ryan in the sixth minute, before Albion first threatened six minutes later. Murray got on the end of Lewis Dunk's ball over the Chelsea defence and found March whose shot was deflected behind for a corner. The Blues threatened again on 15 minutes when Hazard's clever backheel released Alonso but his low drive was blocked by Dunk. Chelsea went ahead just two minutes later. Hazard had a low shot blocked, before he was quickest to the ball, burst forward and squared for Pedro to tap home from a couple of yards. A brilliant challenge by Dunk then stopped Hazard in his tracks when the Chelsea forward looked to weave his way through the Brighton defence midway through the first half. The visitors carelessly gave the ball away on the half-hour mark but keeper Kepa Arizabalaga did well to save March's sweetly-struck 25-yarder low to his left. Chelsea moved 2-0 in front after 33 minutes. Leon Balogun gave the ball away to Willian just inside the Chelsea half and the Brazilian released Hazard one-on-one and he coolly finished past Ryan. That was the way things stayed until half-time and Chelsea almost added a third early in the second half but no one was on hand to turn home Cesar Azpilicueta's low centre. Albion boss Chris Hughton sent on Florin Andone for Murray as he looked to get back into the game but Chelsea continued to look the more likely and Alonso's dipping shot came back off a post on 63 minutes. Brighton responded with a spell of pressure and got a goal back on 66 minutes. Martin Montoya's cross to the back post was headed down by Bernardo for March to turn the ball home from six yards for his first Premier League goal of the season. 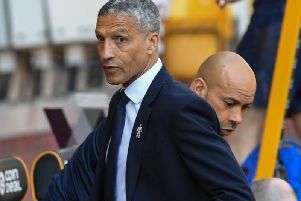 Yves Bissouma and Jurgen Locadia came on for Brighton in the closing stages and Alonso was booked for dragging back March as the winger looked to race on to Bissouma's through ball four minutes from time. March sent the resulting free kick over from 25 yards and Lewis Dunk headed a late opportunity wide as Chelsea held on for all three points. BRIGHTON: Ryan; Montoya, Balogun, Dunk, Bernardo; Knockaert (Locadia 83), Propper, Stephens, March; Gross (Bissouma 81); Murray (Andone 61). Subs: Steele, Bruno, Bong, Kayal. CHELSEA: Arrizabalaga; Azpilicueta, Rudiger, David Luiz, Alonso; Kante, Jorginho, Kovacic (Barkley 76); Pedro (Loftus-Cheek 66), Hazard (Giroud 83), Willian. Subs: Caballero, Christensen, Emerson, Fabregas.